Support one of the COOLest service organizations in Davis! 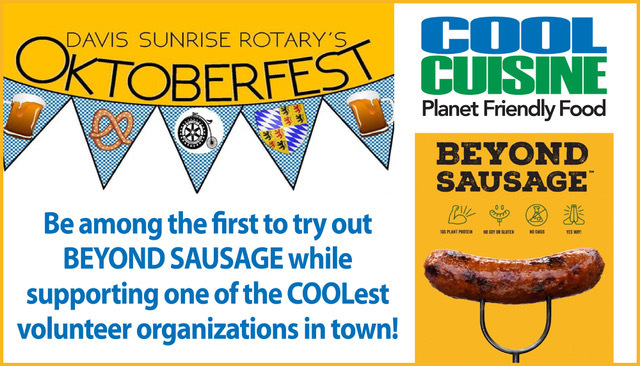 Enjoy Beyond Sausage bratz at the annual Sunrise Rotary Oktoberfest BBQ Saturday, October 6th from 6pm to 9pm at Davis Central Park. COOL Cuisine will host a separate plant-based grill and serve up Beyond Sausage, which will not be available in Northern California until the end of October. Be among the first locals to try it out! The special Cool Cuisine meal will include bratz, side salads, and a complimentary wine or beer at an event with 400 community members. This rotary club is working to make their annual event more sustainable and COOL Cuisine is part of that effort. We are happy for the opportunity to make such a community event COOLer. Oktoberfest is a fundraiser and your $35 ticket helps many local organizations (see below). Student admission is $25. If you want one of these fabulous plant-based meals, please arrive in the first hour. We will be serving Beyond Sausage until we run out (60 servings total are planned) but will have other non-meat sausages after that. All meals are included in the entry fee. WHERE DO FUNDS GO? Davis Sunrise Rotary activities and giving focuses on raising funds mostly for children. Proceeds go to Rotary grants to things like: child abuse prevention, Davis Phoenix Coalition (LGBTQ support), Empower Yolo (battered women’s support), Fourth & Hope Homeless Shelter, Meals on Wheels, Progress Ranch (residential home for boys), Suicide Prevention Yolo County, Yolo Conflict Resolution Center, Yolo County Food Bank, Yolo County CASA (support for children in foster care) and more. On tap for next year is a COOL Cuisine Burger Battle (March 2019). Stay tuned for updates.